There are 10 major programs available to you in the Raj Soin College of Business. Our academic advisors and faculty members are available to help you choose their major. If you intend to major in accountancy, international business or management information systems, you should declare your major before your junior year because these major requirements follow a specific sequence. Generally, it is possible to change majors within business during your junior year without delaying graduation except for these majors. An accountancy degree will prepare you with a solid foundation of financial knowledge and regulations to pursue a variety of careers paths, whether you want to become a certified public accountant or work in finance, corporate management, government, or entrepreneurship. Business analytics is the practice of discovering business insights through exploring and analyzing business information and influence business decision-making through visualization and data communication. The business analytics concentration is available for students who major in management information systems, finance, and marketing. An economics degree provides you with a solid foundation for a career in business, government, or with a nonprofit organization. You will study how societies, governments, businesses, households, and individuals manage and allocate resources and how that effects business decision-making. Graduates skilled in creative problem solving and risk taking with the ability to see new opportunities are in high demand. An entrepreneurship degree will help you learn those skills and equip you with the experiences necessary to succeed in a business environment or start your own venture. A finance degree will give you the analytical skills needed for a successful professional career in today’s global financial markets. You will get a strong foundation in all areas of finance paired with the flexibility to tailor your degree to your future career plans. A financial services degree will equip you with the analytical skills needed to deliver advice and financial products to individuals and institutions. Our curriculum gives you a strong foundation in all aspects of personal financial management and is designed to meet the growing need for graduates who are knowledgeable in all relevant areas. Human resource management focuses on the people and activities at organizations that affect the behaviors of its employees. Human resource professionals are critical to ensure organizations and businesses attract, motivate, and retain a qualified, effective workforce. The skills gained in our program can help managers advance in their careers. International business programs prepare you to work in the global business environment and you will be equipped to handle the challenges that surface when people from many different cultures work together. You will learn about the options business and organizations can use for importing or exporting, gain excellent language skills, develop high culture competence. Managers directly support the efforts of other people in businesses and organizations, including planning, organizing, leading, and controlling activities. In this program, you will help coworkers and employees develop skills, foster teamwork, and create a work environment both satisfying for employees while pursuing the business or organization’s goal. Businesses, nonprofits, and government agencies are increasingly relying on data to drive decision-making, increase productivity and profitability. If you are curious, passionate about innovation, and like solving problems, a degree in management information systems will prepare you to excel in wide variety of career paths and industries. A degree in marketing allows you to choose from a broad selection of courses that will prepare you for a sustainable, successful career. With only three required courses, you can build a program customized to your career goals. Our most successful marketing graduates are bright, creative individuals who are willing to learn and apply themselves. Businesses, nonprofits, and government agencies require people skilled in supply chain management to coordinate the flow of materials, finances, and information within and between companies. Supply chain management graduates have a high chance of placement in an internship or job immediately after graduation and this degree will make you competitive for increasingly important positions. The master’s program offers you a broad education in accountancy-related topics, allowing you to work in a variety of business industries, governmental agencies, or non-profit organizations. Our Master of Accountancy program helps you meet the requirements to take the Certified Public Accountant (CPA) exam or prepare you to work in a variety of career fields. Our Master of Business Administration (M.B.A.) degree offers the advanced education and competitive edge to help you stand out in today’s global economy. We give you a quality education at an affordable rate with flexible scheduling options. 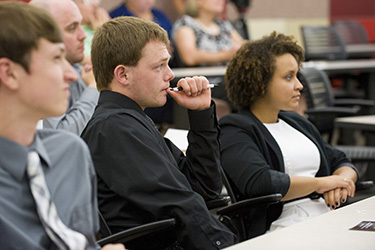 The program focuses on a problem-solving approach to information management, using real-life experiences, case materials, and simulations taught by outstanding faculty and industry experts. If you are curious, passionate about innovation, and like solving problems, a Master of Information Systems degree will enhance your existing experience, help you achieve your goals, and advance your career. Supply chain management specialists are integral to success in today’s market and this program is designed to meet the needs of managerial and operational employees who have logistics, inventory, procurement, management, or decision-making. This program will give you a graduate education that will enhance your leadership career in the field of logistics and supply chain management. A degree in economics provides you with a solid foundation for a career in business, government, or nonprofit sector. In this program, you will study how social factors influence and shape our economy and apply those analytical skills to working in business, government, and nonprofit sectors. This program is flexible, offering evening classes, and full-time students can complete it in 12 months. If you want to major in business, but don’t know which major you are interested, please select the undecided category. You can stay undecided until the middle of your junior year. By that time, you will have completed general education coursework across all major programs and will have more information to make your decision. Both academic advisors and faculty members are available to help you explore majors of interest. If you want to pursue a dual major, you must formally declare your intention and complete all minimum requirements for both programs of study. You can fulfill elective categories in one major with the requirements of the other major you plan to pursue. A minor program provides you with a structured, smaller concentration of study that will be noted on your transcripts. An official check sheet listing the requirements and elective choices will be sent after you are admitted to the minor. You can fulfill elective categories with minor requirements. The following minors are offered by the Raj Soin College of Business. All minors are open to business and non-business majors unless otherwise noted. To apply for the minors, use the Major/Minor Change Request on WINGS Express. Whether you want to work in government, hospitals, entertainment, nonprofits, sports, or other industries, a business minor will set you apart from the other graduates in your career field. The management and financial knowledge you gain will expand your job opportunities or help you get promoted sooner. This minor is only open to non-business majors. An education in economics provides you with a solid foundation for a career in business, government, or with a nonprofit organization. In the economics program, you will study how societies, governments, businesses, households, and individuals manage and allocate resources. A minor in economics will equip you with the skills to make better decisions in a business environment, on public policy, and even in your personal choices. In today’s business environment, graduates skilled in creative problem solving and risk taking with the ability to see new opportunities are in high demand. An entrepreneurship minor can help you learn those skills and equip you with the experiences necessary to succeed in a business environment or start your own venture. International business programs prepare you to work in the global business environment and build skills that allow you to assess the complex problems in global business settings and implement effective and innovative solutions. The minor will equip you to handle the challenges that happen when people from many different cultures work together. Managers directly support the efforts of other people in businesses and organizations, including planning, organizing, leading, and controlling activities. A minor in management will help you develop skills, foster teamwork, and create a work environment both satisfying for employees while pursuing the business or organization’s goal. Businesses, nonprofits, and government agencies are increasingly relying on data to drive decision-making, increase productivity and profitability. Every action we take, from donating blood to buying groceries, is recorded and analyzed to better serve you. If you are curious, passionate about innovation, and like solving problems, a minor in management information systems will enhance your existing major and advance your career. A marketing minor allows you to choose from a broad selection of courses that will prepare you for a sustainable, successful career. You can add this minor to your current degree program and choose minor classes customized to your career goals. Our most successful marketing graduates are bright, creative individuals who are willing to learn and apply themselves. Businesses, nonprofits, and government agencies require people skilled in supply chain management to coordinate the flow of materials, finances, and information within and between companies. This minor will help you enhance your skills as you study the strategies that make business, nonprofits, and governments competitive within a global economy. * An official listing of the requirements and elective choices will be sent after admission to the minor. Non-business majors may complete only one minor. Non-business majors may not take business courses beyond those required for their minor. You must complete at least 50 percent of the minor courses at Wright State University. If you are majoring in economics in the College of Liberal Arts, you may not enroll in any minor program. You must have a 2.0 cumulative GPA in all minor courses.